I moved to my new house in January 2012. I realised the garden although long and thin could be transformed into a really lovely place to be in. I had heard of Carol Bridges’ garden design skills and the fact that she was a friend of old, encouraged me to call her and get going with some plans. Carol’s skill at listening to what I wanted, and knowledge of plants and attention to detail soon became very apparent. We shared ideas and found our tastes to be similar. Ideas soon turned into sketch drawings that were exactly what I wanted. 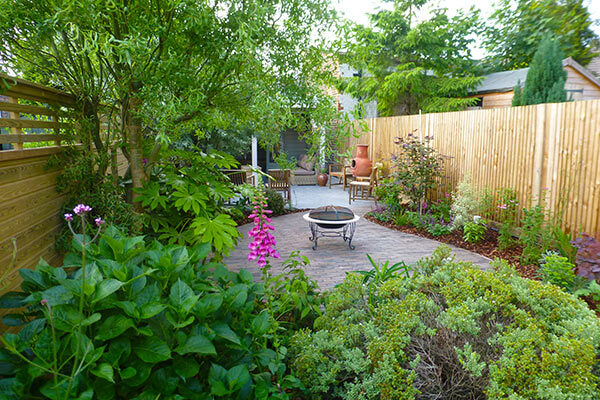 Carol uses a very good hard landscaping company, and along with her understanding of what will work and what is needed, she liaised with them and me to make sure we got exactly what was wanted. She also helped me with the design of my Summerhouse, which is the main feature at the bottom of the garden. I am very happy to say that with Carol’s design skills, planting plan and real understanding of what would transform my garden into a lovely place, it was completed in July and I am loving seeing it develop and can’t wait to get out there again this summer.